Sixteen-year-old Jansin Nordqvist is on the verge of graduating from the black ops factory known as the Academy. She’s smart and deadly and knows three things with absolute certainty. 1. When the world flooded and civilization retreated deep underground, there was no one left on the surface. 2. The only species to thrive there are the toads, a primate/amphibian hybrid with a serious mean streak. 3. There’s no place on Earth where you can hide from the hypercanes, continent-sized storms that have raged for decades. Jansin has been lied to. On all counts. 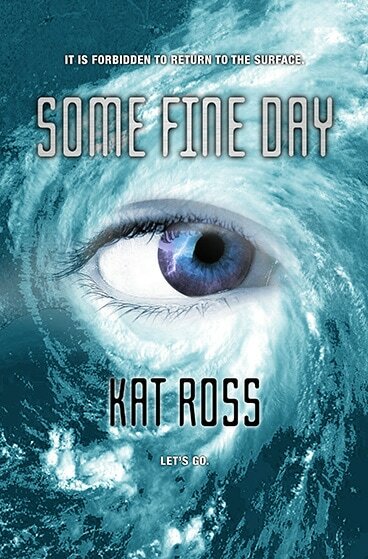 Today we welcome Kat Ross to our blog on the latest leg of her tour promoting her début novel, “Some Fine Day”. Having reviewed this book already and immensely enjoyed it I was overjoyed at the chance to ask Kat a couple questions about the underground world Jansin lives in. How many Underground societies exist and what are their names? The former United States has five: Raven Rock, Greenbrier, Cheyenne, Kirtland and China Lake. I figured that the government wouldn’t start from scratch; they’d use existing military bases with an underground component and just dig deeper. But it seemed crazy to think that the Americans would be the only ones beating a retreat from the surface. So there’s also Nu London, the Pan-African bloc, Aegyptus, the Prussian Alliance and Sino-Russia. Just how quickly were these societies built? I imagined it happening over at least a decade. This is no small engineering feat. But when life on the surface reached a tipping point where it became clear that society was collapsing, the government poured all its considerable resources into the building the prefectures. The first plasma charge is detonated in 2042. How do they stay inter-continentally connected? I love the idea of super-high-speed maglev bullet trains, although I’ve never been on one (yet). So I imagined a network of deep tunnels connecting all the prefectures. Of course, control over those tunnels would also be subject to politics and power plays. Is there a contingency plan for when all the fresh underground water runs out? There are some very deep, very large aquifers under the U.S., but as you say, fresh water is a finite resource. That’s actually one of the big concerns in the story: Raven Rock and Greenbrier are fighting over access to a shared aquifer, and it gets pretty ugly. In the book we understand there could be a war, wouldn’t this just wipe out the societies involved? Conventional warfare would indeed be disastrous for everyone. That’s why the Academy that Jansin trains at focuses mainly on unconventional warfare: sabotage, economic blockades, propaganda, clandestine support of local insurgents—anything to make life miserable enough that concessions can be extracted even if the other side has the ability to continue fighting. How would you feel if you had to move underground and live a life without natural light? Oh, I don’t think I could handle it at all! I get claustrophobic in elevators, so I can’t even imagine living with millions of tons of rock and dirt over my head. Of course, Jan grew up in that environment, so she’s used to it. But I really empathize with Will, who’s lived on the surface all his life. The feeling that he’d rather die than have to stay down there. Even constantly running from hypercanes would be preferable! Thank you for your time and brilliant answers Kat! You can find her on Twitter and her website. Catch my review of the book here.